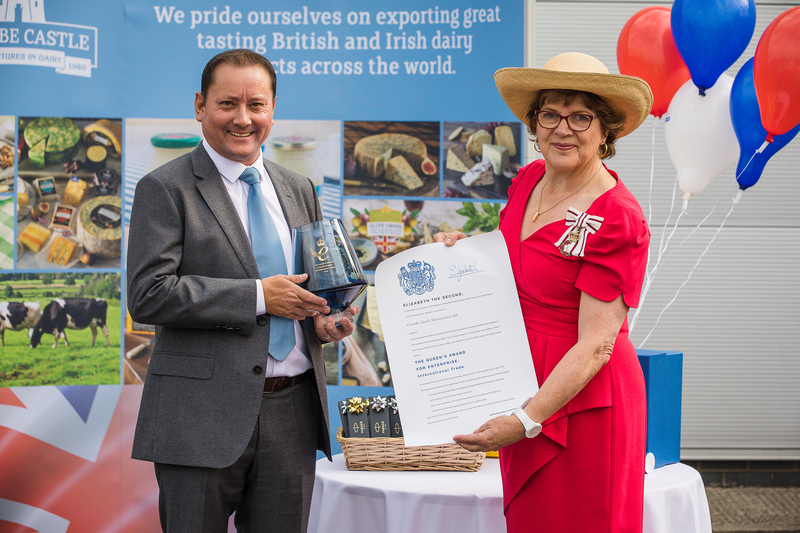 On Friday 20th July Coombe Castle hosted a celebratory ceremony in recognition of receiving the Queens Award for Enterprise: International Trade. The Lord Lieutenant of Wiltshire, Mrs Sarah Troughton presented the award to our Managing Director, Darren Larvin in a ceremony that was attended by all Coombe Castle employees, the local MP Michelle Donelan, and the Mayor of Melksham, Councillor Adrienne Westbrook. Achieving our fourth Queens Award is something few companies in the dairy industry have managed to achieve and is something we are extremely proud of. This year, Coombe Castle were the only company in Wiltshire to receive this prestigious award, which is a testament to the dedication of our staff, partners, and customers. It was a great day for all, reflecting on the growth of our business over the last five years, and the continual hard work of all our employees here at Coombe Castle International.